1. How often do you visit the Netherlands? Now 1-2 times a year. Have been as many as 3 times in the past. 2. What is your relationship with Anna Paulowna / Breezand? Many long term friendships and business relationships with growers in Anna Paulowna (where most of the bulbs we offer are produced). 3. Why do you like flower bulbs from Anna Paulowna / Breezand so much? 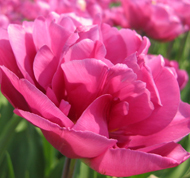 Because the quality of the bulbs produced there is far better than from anywhere else. 4. What do you think of the assortment of flower bulbs grown in Anna Paulowna / Breezand? The widest assortment of quality bulbs in marketable quantities. 5. 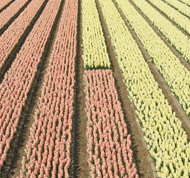 What do you like more: ‘Lentetuin Breezand’ (Springgarden Breezand) or the flowering fields? While we have enjoyed the greatest bulb Flower Show in the world for many years, nothing can beat visiting the fields of growers at flower. 6. What developments did you see in the past years concerning bulb cultivation in general, and bulb cultivation in Anna Paulowna / Breezand in particular? 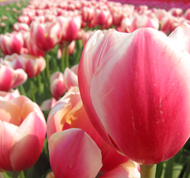 In the 26 years that we done visiting Breezand, we have enjoyed seeing the art of bulb growing refined and improved in many ways. Micro-propagation and more natural and organic approaches. 7. Probably you noticed the increase in scale . What do you think of this? We have enjoyed watching the better growers increase the scale of their operations while keeping the quality of their product. Bravo. 8. What do you think of the 100 years anniversary of flower cultivation in Anna Paulowna? It is wonderful that you get to celebrate 100 years of a job well done! 9. 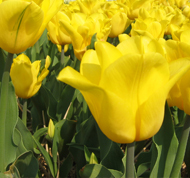 What developments do you expect for the future concerning bulb cultivation in general, and Breezand Anna Paulowna in particular? 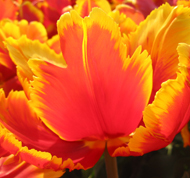 We are looking forward to many new and exciting introductions of new bulbs that are in the pipeline. 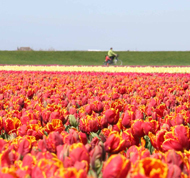 We expect to see more environmental friendly efficient production of bulbs. 10. Would you like to add something to the interview? We thank all of our many friends for making us welcome and at home in Breezand / Anna Paulowna and for producing the finest horticultural products available anywhere in the world. Thankyou for being part of our team in supplying the world with more smiles. Plant bulbs and harvest smiles.